FRANCIS LEROY, BIOCOSMOS / SCIENCE PHOTO LIBRARY. FRANCIS LEROY, BIOCOSMOS / SCIENCE PHOTO LIBRARY. 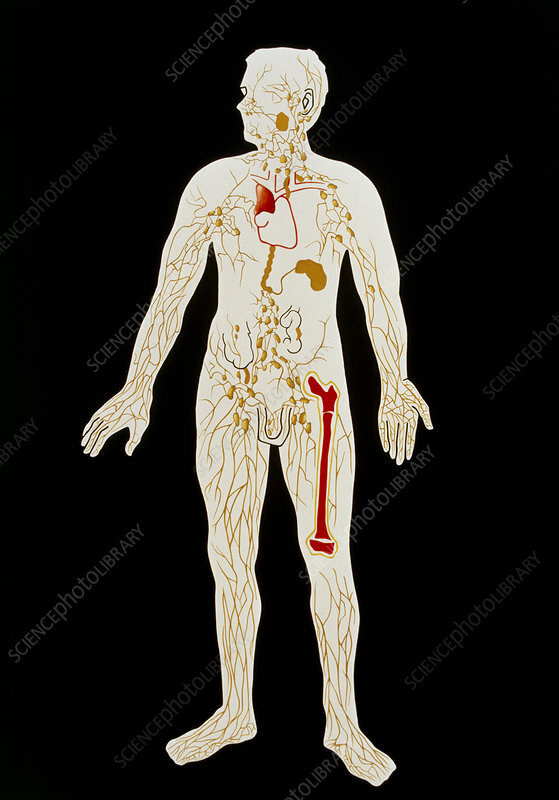 Artwork illustrating the human lymphatic system, a network of vessels that carries lymph (water, proteins, electrolytes) from the tissue fluids to the bloodstream. At intervals along the length of lymphatic vessels are swellings (nodes); groups of nodes are found in the groin, neck, armpit and behind the ear. The nodes function to "filter" lymph through the action of scavenging macrophages & prevent foreign particles from entering the bloodstream. They are also sites of storage & proliferation of both B- and T-lymphocytes, white blood cells involved in the immune response to infection.